Not garden pests but part of the fashion trend to 'curate' your ears - hey, no laughing at the back, it really is A Thing. These unusual hammered, textured silver numbers, created by Scottish designer Chris Lewis and available at Biagio in Thame and Bicester (£105), are a fine example of the statement earring. There’s a lot of them around – and banish all thoughts of Pat Butcher, because daring danglers couldn’t be more chic. As someone who doesn’t have her ears pierced (yup I’m the only auricular virgin in the village) I’m about to lose out on a whopping great fashion trend. Kerry, who works with me at Muddy, is the other end of the spectrum, with five piercings – two in her left ear and three in her right. Apparently multiple piercings are the new leather trousers (read: new midlife crisis) but frankly if you’re going to be penetrated repeatedly by a hard object, you might as well enjoy the outcome. Fashion editors have long visited Maria Tash in New York for her expensive but beautiful gold and diamond studs and hoops (Kerry has this punky spiked one) to dot prettily up their lobes. Tash now has a UK outpost in Liberty, where her staff will pierce you with your choice of earring – so you don’t have to have a crap steel ballbearing for eight weeks like in the ’80s. And then there’s the rise of the ear selfie on Instagram to show off your new haul – yep, really. For inspiration, check out @earafterear on Instagram, where fashion writer Tilly Macalister-Smith “curates the world’s best face furniture”. Meanwhile, celebrities who give good ear include Diana Kruger and Emma Watson – a star’s earring wardrobe is now a consideration on the red carpet. Who’d have thought it? With the trend comes a whole new lexicon, so pay attention at the back please. In terms of piercing, as well as the normal lobe, you could get one in your helix (the top bit – be warned, it took a good year to properly heal), the daith (the bump just above your earhole) or the tragus (in the middle, where the ear joins the face). Then there are the numerous varieties of earring. Climbers and crawlers are the long curved ones, like caterpillars that snake up your lobe. Jackets are dangly attachments that you attach to the back of a lobe stud, which then wrap around the back of your lobe and hang prettily underneath. Cuffs you can probably work out, while chain orbits link up multiple studs and ‘throughs’ are long thin earrings with no backs. Got all that? Retailers report that earrings are now the fastest-growing jewellery category, and there’s a massive range of styles out there right now. Either go very small (the dainty gold studs and hoops are still selling well) or very big (very cool right now). 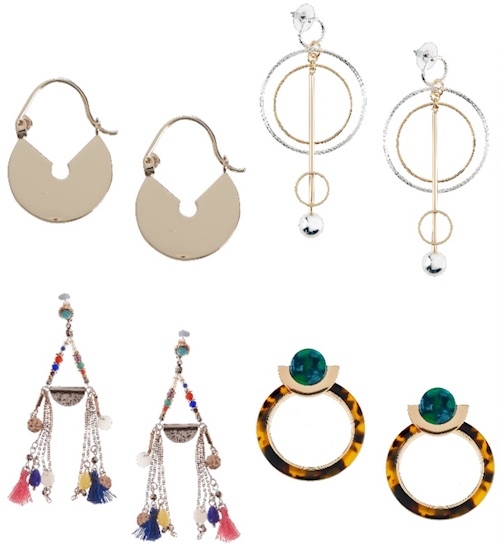 For affordable designer earrings, hip new(ish) designer Theodora Warre, is doing tricked-out hoops for under £100. Astley Clarke is great for cool studs (check out the lightning bolts) and they are sold as singles, as well as pairs, which is perfect for a mismatched look. On the high street, & Other Stories’ jewellery is always worth a look and M&S are majoring on massive danglers for spring/summer. But the Muddy top tip is Z For Accessorize. Don’t dismiss this shop as a teenage girl’s paradise – you can get multipacks of quirky gold-plated studs from their fashion-forward line by Zara Simon (her pretty stacking rings are brilliant value too). So have I sold you on the idea of ear curation? Good! And here’s how to proceed. Firstly, go somewhere reliable to get new piercings, because if it’s done badly, it can take forever to heal. I recommend the aforementioned Maria Tash at Liberty, or Kevin and his team at Meta Morphosis in Topshop Oxford Circus. Perhaps plump for an uneven number of piercings in each ear otherwise it can look too matchy-matchy. 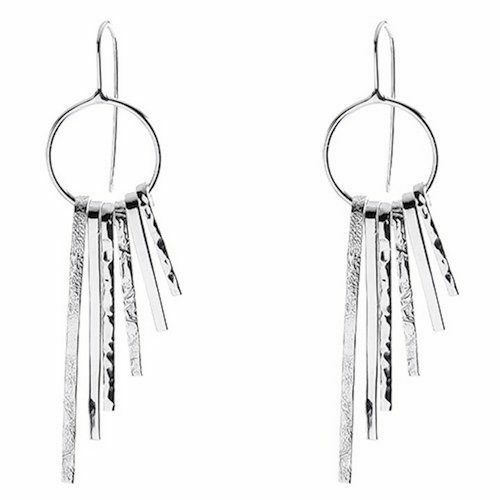 And finally, let your earrings do the talking – they look brilliant with a messy ponytail, jeans and no other jewellery. Basically, a midlife crisis never looked cooler.